The area a SWAT team surrounded Thursday night in Clarence Center. WBFO's Mike Desmond says a 26-year-old distraught man who had a gun in his possession came out of the woods near his Heise Road home. 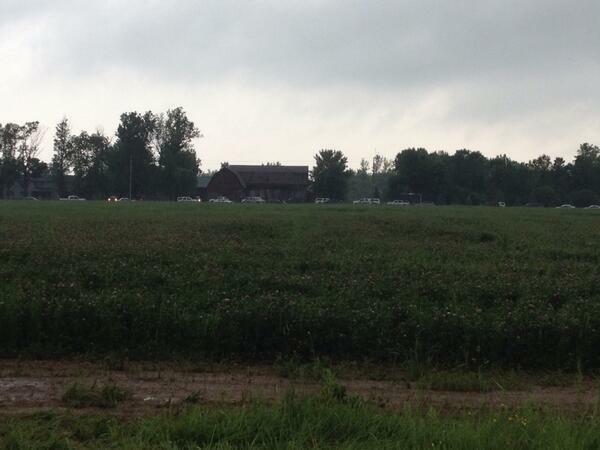 Erie County Sheriff's Deputies took control of the gun. Right now, authorities are trying to determine if he did anything wrong, so there are no charges yet. The man, who was not identified, was taken to the Erie County Medical Center for a mental health evaluation. The Sheriff's Chief of Police Services Scott Joslyn told reporters deputies responded to a call at a Heise Road home at 3:30 Thursday afternoon. By the time they arrived, a 26-year-old resident of the home had retreated into nearby woods, armed with his gun. Joslyn said he did not make any threats to law enforcement officers or any member of the public. "We (were) concerned for his safety," Joslyn told reporters at a briefing shortly before 8pm. Though at least two gunshots were heard, Joslyn said it's not illegal to discharge a long gun on one's own property in that area of Clarence. The sheriff's department had set up a perimeter and evacuated several homes on Heise, County, Green Acres and Lapp Roads. Residents were allowed to return after the situation ended. The Eastern Hills Mall was briefly in a lockdown mode late Thursday afternoon. But the lockdown was lifted after 6pm when mall security was assured the man was not a threat.